It’s no secret that I love starting my day with a delicious smoothie – it’s quick, it tastes great, AND it nourishes my body. What’s not to love? When it comes to healthy foods, smoothies really do have it all. There is so much information out there about what to put in your smoothies to satisfy your taste buds and give your body the maximum amount of nutrients, so I wanted to put together a list of the healthiest of 10 healthy foods to add. Cacao is the seed of the cacao tree, native to the tropics of South and Central America. It’s the origin of everything chocolate, and the perfect way to add a bit of indulgence to your smoothie. Make sure you get raw cacao as that’s the kind that’s packed with nutrition – it contains more antioxidants than blueberries, green tea, or red wine! It increases good cholesterol, improves blood flow (which reduces the risk of heart attack and stroke), regulates blood sugar levels, helps maintain healthy brain function, reduces blood pressure and acts as a mood booster (yes, it actually makes you feel better!). Add a tablespoon of cacao powder or cacao nibs to your smoothie and don’t forget to add a natural sweetener, as cacao isn’t naturally sweet! I wrote an entire post about the health benefits, you can read it here. The acai berry grows on acai palm trees in Central and South America and contains even more antioxidants than cacao. Acai berries are low in calories and high in fiber, protein, trace minerals and monounsaturated fats. They have been shown to aid weight loss, help digestion, lower cholesterol, kill cancer cells and prevent atherosclerosis. 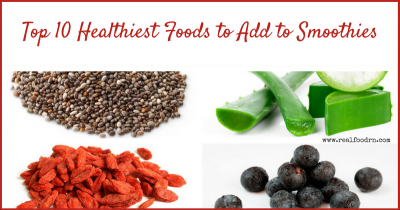 Try them in combination with any of your favorite smoothie fruits. I get the whole berries frozen from my local health food store, but you can also get the powder online. People in Nepal, Tibet, and China have appreciated the nutritional benefits of goji berries for millennia – the first reference dates back at least 2,500 years ago! The small pink berries are tangy in flavor and are packed with vitamins, healthy fats, trace minerals, and antioxidants. They’re also a great plant-based protein source. Modern research has found that certain oils present in goji berries can even have an anti-aging effect. I wrote an entire post all about the health benefits of these amazing berries. The way that I get them into my diet every day is through this AMAZING goji berry (wolfberry) juice. We will never go one day without it! If you want to add more healthy foods to your smoothies, don’t forget about honey and bee pollen. Honey is anti-inflammatory, loaded with antioxidants, and improves digestion. Bee pollen, a mixture of the pollen that bees collect from flowers and the enzymes that they add, contains all the nutrients that people need: protein, carbohydrates, fat, antioxidants, vitamins, and minerals. It has been found to aid weight loss, improve digestion, help people with anemia by increasing red blood cells in the bloodstream, regulate cholesterol, and slow down certain aging processes. Both honey and bee pollen will add a natural sweetness to your smoothies. — you can find pollen here and raw honey here. Chia seeds are yet another ancient super food – they were already cultivated by the Aztecs in Mexico and Central America before they became mainstream in the U.S. and Europe. They are high in fiber, healthy fatty acids, and protein, and have zero cholesterol – great for heart health. Plus, they have a high concentration of minerals like calcium, phosphorous, potassium, zinc, copper, and manganese. They’re a nutritional powerhouse! Try adding a tablespoon or two to your smoothie – they’re great for weight loss, provide long-lasting energy, and improve digestion. I have a lot of posts using chia seeds, you can find them here. You can also find chia seeds here. The maca root grows in Peru and has been regarded as a miracle food for centuries. It boosts virility and fertility, plus can enhance your mood. Most people will feel a burst of energy within minutes or hours of eating maca. Maca is also great for vegans and vegetarians as it’s rich in protein and B vitamins. You can buy it in powder form – perfect for adding a teaspoon or two to your favorite smoothie. — you can find it here.